The DuPont Fire Department was established in 1910. Membership was made up of plant employees and citizens in town, mostly younger boys who would man the hose carts located in and around town. Some of these boys would get the hose carts to the fire, and by that time, the older men from the plant would arrive and take over. In the early 1920's DuPont Company #11 was added to the firefighting forces of the Village and is said to have been the youngest firefighting department in the United States. The oldest member was only 12 years old and the youngest member was only 7. Fire Chief Robert Hull was only 11 years of age. This organization started as a result of the boy's efforts in bringing a dangerous grass fire under control. 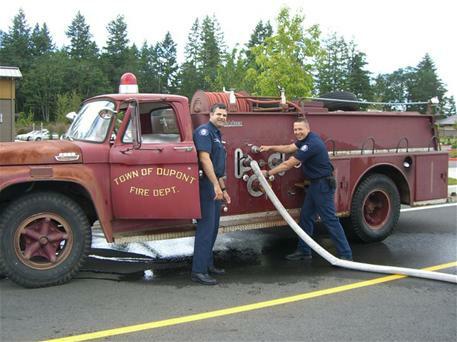 In 1963 the town purchased its first pumper at a cost of $49,000 cash. The station at that time had to be extended both length and width wise to accommodate the pumper. It had been a one man garage prior to the time. Photo of the pumper that was purchased in 1963. As of early 2018, the Department includes a Fire Chief, Assistant Chief, Fire Marshal and a daily staffing minimum of three personnel on an engine. Occasionally they split the crew to respond an Aid Unit with the engine on critical calls. The Aid Unit is not a “Medic Unit” and does not have a paramedic on board. The creation of an advanced life support response capability with Fire Department paramedic/ firefighters is a critical need and a priority, when funding can be secured. There is one fire station in DuPont located at 1780 Civic Drive.